“NZ Shock: Losers take power” was the headline in The Australian newspaper on Friday. It is a shock to many that the party with substantially more votes than any other party is now in opposition. More so because that party has delivered low inflation, low interest rates, low unemployment, and one of the fastest growing economies in the OECD. New Zealand First has invited into government the most radical left wing alliance in this country’s history. 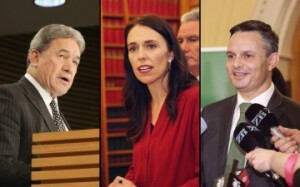 While all previous governments have been responsible enough not to allow the deeply socialist Greens anywhere near ministerial power, Labour’s new Prime Minister in waiting has given them three Cabinet posts. One of the Green’s demands agreed to by our new Prime Minister is a nationwide binding referendum on legalising marijuana for personal use. This is what Mr Peters has signed the country up to by supporting a Labour-Green Government. What Winston Peters has not signed the country up to is a binding referendum on the future of the Maori seats – despite that being ‘a bottom line’ New Zealand First commitment in any new government. But he has now reneged on that commitment and the promises he gave to attract support for his party. So there you have it. Winston Peters has said that not enough people supported him to warrant honouring his promise. What utter nonsense: Voters delivered enough support to New Zealand First to enable Mr Peters to dictate the terms of a new government – which is exactly the position that he wanted to be in. If holding a referendum on the Maori seats was truly a bottom line, he could have delivered it during this Parliamentary term. He then went on to say that he was foreshadowing the downturn so as not to get blamed for it when it arrives. Not only is the statement extraordinary but his position of trying to distance himself from any future economic decline is even more bizarre, considering that he will be a key player in the new Government. In effect, Winston Peters is trying to excuse himself from having any responsibility to keep the economy strong – surely a core duty of government. Given his gloomy economic forecast, it is even more inexplicable that he would turn his back on National as a coalition partner. Despite National’s shortcomings, the Party has proven itself to be very competent at managing the economy during tough times – including economic recession, the global financial crisis, the Christchurch earthquakes, and commodity slumps. Despite that record, Winston Peters has decided that Labour’s totally inexperienced Grant Robertson will be a better economic manager for New Zealand. Mr Peters may well be right in his prediction of gloomy economic times ahead, but if that’s the case it is likely to be exacerbated by the policies of the new coalition government. • Cancelling the tax cuts. • Reducing immigration by 20,000 to 30,000 a year. • KiwiBuild: building 10,000 affordable homes a year for 10 years – half in Auckland. • Restricting land sales to foreigners. • Re-negotiating the Trans-Pacific Partnership to ban foreigners from buying New Zealand land. • Requiring the Reserve Bank to give greater weight to full employment when setting interest rates. • Scrapping charter schools and National Standards. • Re-entering the Pike River mine. • Considering moving Auckland’s container operations to Whangarei. So while Winston Peters campaigned on abolishing the Emissions Trading Scheme, he is now propping up a government that wants to expand it by adding agriculture. National has not included farming in the ETS because there is no way of reducing greenhouse gas emissions from livestock – except by reducing livestock numbers or forcing farmers to pay financial penalties. That means the end result of this decision to bring agriculture into the ETS will be to force up the price of food – and reduce the viability of agricultural exports. This is in spite of the fact that during the election campaign, New Zealand First promised to reduce the price of food and improve the prospects for exporters… yet more broken promises from New Zealand First. • Making the first year of tertiary education or training fees free. • Increasing student allowances and living cost loans by $50 a week. • Introducing a Healthy Homes Guarantee to require all rentals to be warm and dry. • Stopping the state house sell-off. • Establishing an Affordable Housing Authority. • Introducing the Families Package: Winter Fuel Payment, Best Start, Paid Parental Leave. • Establishing a Ministerial Inquiry into mental health. • Making medicinal cannabis available. • Resuming contributions to the New Zealand Superannuation Fund. • Establishing a child poverty reduction target. • Substantially increasing the power of the unions. • Establishing a Tax Working Group to investigate a Capital Gains Tax. • Establishing an inquiry into the abuse of children in state care. • Holding a Clean Waters Summit. • Establishing an independent Climate Commission. Once the impact of this policy mix – cancelling the tax cuts, cutting immigration, strengthening the unions, increasing the cost of the ETS, penalising farmers, lifting the minimum wage, and implementing an extremely expensive social policy agenda – starts to bite, it won’t take long for the economy to struggle. By choosing parties to be New Zealand’s new government that will increase spending in this way, Winston Peters is virtually ensuring his predictions of a negative economic outlook will come to pass. So what will be the shape of the new Government? The Prime Minister has announced that there will be 28 Ministers in the new Cabinet – the same number as previous governments. Of those, Labour will have 16 Ministers inside Cabinet and 5 outside. New Zealand First will have four Ministers inside Cabinet and one under-secretary, and the Greens will have three Ministers outside of Cabinet and one under-secretary. Labour has negotiated a full coalition agreement with New Zealand First, while the Greens have a confidence and supply agreement. The distinction between these two arrangements is important. With a coalition agreement, New Zealand First will be part of the Government and will be bound by Cabinet collective responsibility. That will preclude them from criticising any decisions made by the Labour-led Government. In contrast, being a support party outside of Government means that the Green Party will be bound by Cabinet collective responsibility only in the areas in which they have ministerial positions. They will be free to attack any other policy decisions that they disagree with. So there we have it – the 7 percent party with 100 percent of the power, which was free to form a government with either the winner of the election, National, or the loser, Labour, has chosen the losing coalition to form New Zealand’s new Government. In addition, Winston Peters has reneged on his promise to hold a referendum on the Maori seats, even though he knows that he has many New Zealanders concerned about the growth of race-based privilege to thank for making it back into Parliament and giving him the privilege of being MMP’s 2017 kingmaker. Those people will now be regretting they believed he would honour his promise. “The big question mark overhanging the three headed coalition is stability. Of the three, New Zealand First has the most riding on the success of the new government. Unlike the Greens who see Labour as its natural coalition partner, New Zealand First supporters were not committed one way or another. Many voted for New Zealand First on the expectation that it would side with National and deal with issues like race relations. Those supporters will feel betrayed and cheated and will now become critics rather than supporters. This is an interesting point. After the 1996 election, New Zealand First entered into a coalition with National – but it did not last. At the 1999 election, their party vote plummeted from 13 percent to just 4 percent, and they only survived because Winston Peters held onto his Tauranga electorate seat. In 2005, they entered into a confidence and supply agreement with Labour, but Winston Peters was forced to stand down from Cabinet and their party vote fell to just 4 percent at the 2008 election. Without an electorate seat, they were ousted from Parliament. All in all, New Zealand First does not have a strong record of bringing stability to governments in which they hold Ministerial portfolios. And with Jacinda Ardern giving four Cabinet posts and one under-secretary’s position to New Zealand First’s nine MPs, the future could be a challenge. This is especially the case given that the National Party – as Parliament’s largest party by 10 seats – will be unlike any previous opposition. In Question Time, since oral questions are allocated according to the proportion of non-executive members in a party, National will be entitled to around eight questions out of 12 each day, leaving Labour with three, and the other parties sharing one. That means the Opposition’s ability to hold the Government to account will be greater than in any previous Parliaments – and the Government’s opportunity to promote their agenda will be substantially less. The newbie Ministers and Prime Minister will come under intense scrutiny and pressure, and they will need to perform exceptionally well if they are to hold the three party coalition together. While Winston Peters’ decision to choose the losing parties to form the new Government is in itself a shock, many are now saying it’s also a failure of MMP. Under Germany’s MMP system, the party or bloc that takes the most seats has a mandate to form a government. If none has a majority, talks on forming a coalition ensue. In other words, their system has a safeguard that makes a coalition of the losers unlikely, as it’s the most popular party that takes the lead, not the party that holds the balance of power. This is less likely to result in the horse trading that New Zealand First engaged in, and it is therefore more likely that the government will include the party with the most public support. Clearly there is something wrong with our MMP system that needs to be fixed. Do you believe that under New Zealand’s MMP system, the party with the most votes should be given the first opportunity to form a government? Yes, but did National want to stay in power? They know that the MMP system ensures that no ‘Party’ is likely to gain sufficient majority to be able too govern alone. Yet they  Put maximum effort in winning back the Northland seat, yet still gifted the Epson seat to ‘Seymour’. National was the ‘Party’ that signed the UN ‘indigenous’ peoples agreement, so the Maori Seats must remain. Nationals answer to the financial crises was too increase our national debt by TEN-FOLD, so Winston is quite right in predicting a shaky financial future. Was joining the Loopy Left, a better alternative? Of course it wasn’t. He should have sat on the cross-benches & let legislation that he could live with go through, while opposing that which the majority of the public would oppose. Interesting that minor ‘Parties’ not in government were allowed no TV time at all. Had the ‘Conservative Party’ been given any time at all, their 4per-cent from last time, could have become 5per-cent this time, & National could have formed a Government without NZ First… A.G.R.